Sound of Voice: Deep, but not Barry White deep. Usually has a playful tone, but can be cold at times. Appearance: Kisho has dark red hair which spikes out, the length of it ending at his neck. He wears a neatly fitted black shinigami kimono, lined with white. 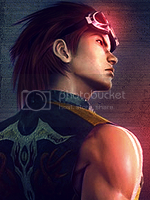 The kimono however is sleeveless, revealing his well defined, muscular arms. Like his arms, the rest of his body is in great shape, with no fat seen anywhere. He has no facial hair other than his eyebrows and eyelashes, as he chooses to keep the clean shaven look. Likes- Sweet and spicy foods, games and tricks, and fighting. Dislikes- Idiots, Stuck-up people, and boring people. Personality: Kisho is very playful, even during times of battle, one would question if he's serious. That's all part of Kisho's defense mechanism, he doesn't want people to see what's really going through his mind. He reaches out to people, the life of the party, yet inside he's alone. He tends to flirt a lot with subordinates, getting joy out of making them feel uncomfortable. He's never been in love, though he's always had some kind of fling. He doesn't get angry often but when he does, it's a completely different side anyone has seen. He can become the most cold, sarcastic person ever. With words he will break spirits and not care. Only when angered in battle, can someone tell if he's serious, for he will not talk to his opponent, and will set out to defeat them, no matter what. Defining Characteristics: Kisho's only defining characteristics are his choice of clothing and his unfitting personality. He chooses not to wary the usual shinigami wear becomes he likes to stay hip with the carefree life of those in the living world. Specialties: He can sense spiritual pressure from very far ranges and is even able to class them. He also has skills in deception and detecting it. When alive and well, Kisho worked at a gentlemen's club owned by the yakuza, as a bartender. He wasn't a big drinker himself, nor did he do drugs. However, he always had a knack of getting in trouble. There would always be some thug trying to demand things from Kisho, even some attempted to belittle him. Kisho was full of much self-respect for himself to let some person push him around. This resulted to him getting into countless fights at the club. He both won and lost several fights, yet the losses barely affected him and his pride. One day, Kisho was leaving from work and heading home. It had been a long day and he was worked like some kind of slave. As he veered around a corner, some random punk came at him with a pocket knife and demanded his money. Kisho, as prideful as he was, wasn't gonna let this just happen. There was a fight, a long one, where Kisho seemed to have the upperhand. Though he sustained many cuts. Suddenly, another person came to the punk's aid, and stabbed Kisho in his back. This led to his inevitable death. Kisho lived as a officer of the Gotei 13 for quite awhile. He didn't stay in the academy long either, for he was a quick learner and well adapt. When Kisho first became a shinigami, he was always being scouted by lieutenants and captains. They saw great potential in this young man. When Kisho finally got into a squad, he didn't stay very long. Different captains wanted to see how well he'd do in their divisions, so he got passed around a lot. He moved in rank almost every time he got passed. After some years, Kisho finally settled into the 2nd division as their lieutenant. He witnessed the change of leadership throughout the Gotei 13, making him feel uneasy at awkward moment. There were some cases where even the lieutenants were gone, and he had to step up and take charge of his division. Kisho didn't like being put so high in ranks, there were cases where shinigami within the division would put hits out on their captains. Many of these hits failed, but the lucky ones that succeeded would either take control of that division or flee out of guilt and fear of Central 46. Kisho has found himself fighting to protect his captain many times, he hated being put against his stupid comrades in such ways. But all of that is in the past and now, there seems to be some stability. But who knows how long it will last, before something else crazy happened.